Kingdom of Gug - Froggers Bad Wart Day (Easy to Hard Mode). Sin (Angels) Hidden Faction Guide. Musket is the only faction in this game that can use firearms. Its initial game difficulty is very easy due to its solid starting position and musket's strong defenes. Its 4 star difficulty rating can be misleading. But that's mostly due to Musket's late game campaign mission requirements. Musket is the only faction that needs to conquer the entire continent, including Crime territories. Despite some claims that Musket is OP (trust me if Musket is OP over half of the entire factions ingame are OP too), you will be having extremely hard time dealing with dwarves and Lizardmen. Sometimes you will find it impossible to defeat dwarven or lizardmen armies no matter how much you milk your brain for brilliant tactics or strategies. But that's to be expected. Lizardmen and Dwarves are your hard counters. Life isn't a cake walk. But do not worry, conquering the entire continent isn't impossible. I made this guide to help new players with their first Musket campaign. At the beginning of the campaign, you'll start with 8000 credits along with a few mercenary squads and heroes. The first thing you have to do is to recruit soldiers and officers. If you don't mind restarting the campaign over and over again to shuffle available heroes, I suggest you keep an eye out for Clifford or Tereza. Recruit them immediately if they are in the vicinity. This will help with your mid and late game phase considerably. Also keep an eye out for heroes such as Karel, Baldomero , Seibe, Arts, Elsa, Celeste, Ricardo, etc. They are not as important as Clifford or Tereza but they are still very useful in battles. When recruiting soldiers, I recommend keeping the ratio of either 7 musketeers to 3 mercenary (for huge armies made up of more than 15 squads) or 6 musketeers to 4 mercenary (for armies less than 15 squads) for balanced gameplay. Once you are finished recruiting soldiers, you should divide your forces into three. One is for conquering the Argyre Islands. The other is for garrisoning Fortress of Noachis. The last one is for conquering Forest of Tulley and Snow Plains of Nilus. Honestly, you are not actually in a hurry to conquer Forest of Tulley or Snow Plains of Nilus (unless you modified the game files and added Sin faction to the campaign). 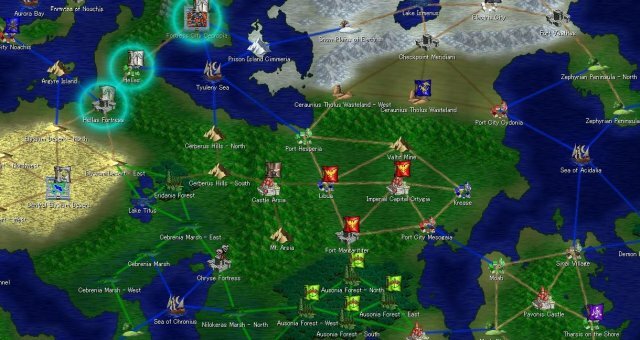 But conquering these territories early helps your armies and heroes lvl up faster so that you can defend Argyre Islands or Fortress of Noachis more easily. Make sure you fully garrison Argyre Islands and Fortress of Noachis as soon as you can. At around turn 3 or turn 4, Castus or Knights of Cunitz might invade Argyre Islands. But don't worry, as long as you have a sizable garrison up there you will be fine no matter how outnumbered you are. Just man up the castle wall with your musketeers and let your enemies come to you. Make sure you block stairs leading to the castle wall with your mercenaries. I recommend your musketeers to hold position in tight group formation to repel invaders more effectively. Musketeers running around back and forth is both unnecessary and detrimental to your firing rate. Castus and Knights of Cunitz have strong cavalries but they are useless unless they can make use of their speed advantage which will already be negated by sea terrains type. Just hold the line and pick off those mounted dogs one by one. After Successfully defending Argyre Islands and Fortress of Noachis and having managed to inflict severe casualties to either Castus or Knights of Cunitz, it is your turn to counterattack and fulfill your dream of world conquest. So Your army is standing strong while your neighbors are licking their wounds. Now is the time to send your armies to take enemy territories by force. First establish diplomatic ties with Reinald Empire. Reinald Empire is renowned for their strong fire mages and heavy hitting cavalries. They can destroy Makan or Kingdom of Gug easily since demihumans are so weak to fire. They might or might not be able to destroy dwarves but that depends mostly on RNG. low lvl dwarves are weak and there is a chance that Reinald Empire might invade and crush dwarves early in the game. But if they didn't manage to destroy dwarves early in the game, they won't ever be able to destroy dwarves on their own. Ok enough diplomacy and back to conquering and plundering weaklings. Your first target will be Hellas Fortress. Why? Because in plains or desert, your army will be at a disadvantage. Those camels and horses will trample your troops under their hooves if your mercenaries aren't strong enough to hold the line. Even if they do, you will suffer heavy casualties. Of course, both Castus and Knights of Cunitz must be wiped out sooner or later. But now is not the best time to do so. When assaulting castles, be sure to inflict as much casualties as possible on defenders inside the wall with your musketeers before breaching the castle gates. as long as the castle gates take some damage, your enemies will not be able to send out their cavalries or melee infantries out until you destroy their gates. Also don't forget that summons such as hunting dogs, elementals, undead minions, golems, etc. can go through castle gates even if the gates are locked. If you managed to recruit Clifford or any other Dragon Knight officers such as Liliana or Cedric, you can use them as long ranged siege cannons before sending your troops in. Once Hellas Fortress falls and your mercenaries are strong enough to hold their own against enemy cavalries, you have to choose how to proceed with your conquest. Will you go after Knights of Cunitz and absorb their talents(officers such as Sigiswald or Arlette)? or go after Castus and Lion? In terms of difficulty, Lion is harder to defeat than Knights of Cunitz. But if Lion is left unchecked alone for too long, they can be such a pain in the♥♥♥♥♥to deal with later. Also incorporating their earth mages into your forces will help you in your fight against dwarves or lizardmen in the future. On the other hand, Knights of Cunitz can offer you excellent officers such as Arlette, Sigiswald, Dirk and the like. Also their high lvl enlistee type heavy infantries can hold their line against dwarven infantries while your musketeers snipe dwarven mages. No matter which faction you choose to go after, keep in mind that Musket primarily depends on defensive tactics to defeat enemy armies. You may move your armies to deny your enemies terrain advantages or kite enemy troops around. But if attacking enemies directly doesn't offer you any visible benefits I advise you to keep your distance from your enemies. If you have tactical advantages and enemy troops refuse to budge, send one of your fastest troops around to provoke them into attacking you. Dealing with Knights of Cunitz is simple, avoid plains. If you have to fight in plains, hide your army behind woods so knights must go through the woods to attack your army. If there are no woods and there is no way to avoid a direct confrontation, then send your mercenaries to intercept enemy cavalries. Once enemy cavalries are engaged in melee, you can circle your musketeers around to pick off enemy targets. I think this tactics is called "Hammer and Anvil" (you can search wikis for various military tactics and maneuvers). Instead of cavalries, you are using musketeers to flank your enemies from behind. This is gonna be your bread and butter tactics against most of the armies you encounter ingame. As long as there is no Arlette nearby, it is also a good idea to fight enemy cavalries in water. In water, long ranged units have the upper hand against melee units. Also Cavalries will be moving so slowly that by the time they reach your army most of them will be already dead. Hammer and Anvil combined with fighting in water proved to be effective even against well trained dwarven(one of the toughest opponents ingame) armies, though many troops were lost in the process. Fighting Lion is trickier. Hammer and Anvil isn't particularly effective against Lion. Your melee troops will be massacred by earth mages in the process. Also Lion can move fast over wasteland terrain types such as deserts. There is no easy victory against Lion. But the only way to minimize your casualties is to constantly move and kite Lion armies as best as you can. First slaughter hunting dogs and their soldiers with your mercenaries. Then withdraw your mercenaries and snipe earth mages with your musketeers. Do your best to keep your troops outta earth mages' poison geyser AOE effects. Never directly engage earth mages with your melee troops especially if they lack poison resistances. Castus, Alcatraz, Dragon Knights of Fevnir, Reinald Empire they all can be defeated easily with Hammer and Anvil tactics. Just be wary of their heroes and their special abilities. Look out for heroes such as Dina, Diethard, Baldur, Wishbone, Ishak and Firoz especially. Send in your summons to neutralize their AOE abilities before surrounding them with your melee infantries to beat the crap outta them. Otherwise yeah, same tactics and strategies. Your toughest enemies in this campaign will be Makan and Apoitakara. They are extremely bullet resistant. Their melee infantries can crush your mecenaries one on one. Facing these ♥♥♥♥♥♥♥s directly with your musketeers will be your worst nightmare. There are two ways to deal with this problem. One is to use diplomacy to support other factions into doing your dirty work for you. 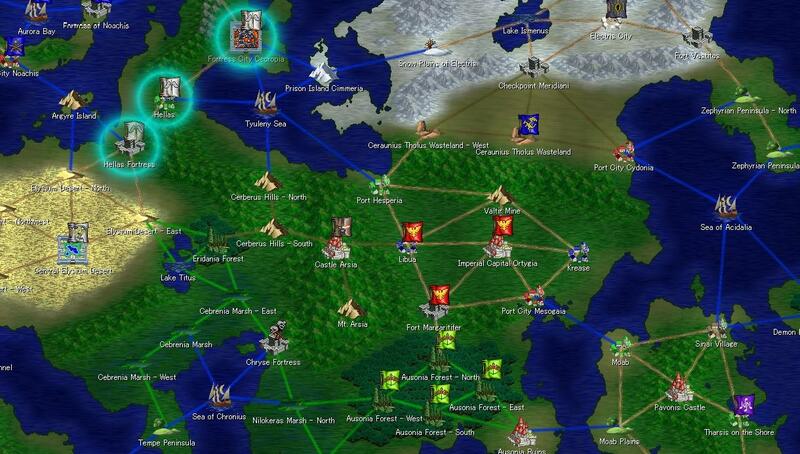 (most likely Reinald Empire) Second is to recruit as many fire mages and ice mages as possible before declaring war on them. By the rule of thumb, fire mages are effective against lizardmen whereas ice mages are effective against dwarves. Still, you won't be able to recruit either of them much since you can recruit only one fire/ice mage squad per mage type officer. Use Hammer and Anvil tactics to buy time for your mages and musketeers while they are slowly picking off enemy troops one by one. Make sure you use your terrains to slow their armies down before engaging them directly. Use your summons to waste their hero abilities. Basically throw everything you got at them whenever you fight these guys. Whenever you have an opportunity to isolate and decapitate enemy faction leader, take it no matter how costly it is. In the long run it will all be worth it. For defeating Kingdom of Gug, keep your distance and let your musketeers do most of the killing while you use your mecenaries to hold off frog soldiers whenever necessary. It plays out just like Lion conquest. Avoid trying to chase down sonic mages with your mercenaries. They will get massacred. If Alfheim somehow managed to survive Makan assaults, you might be forced to fight elves eventually. Elves aren't particularly difficult to deal with. Make sure you watch out for heroes such as Ephemeral or Meinrad. Again send your summons to neutralize their special abilities and keep away from Meinrad's poison mushrooms. If possible, try to lure elves to a body of water such as lake or river. Once their movement is hampered by water you can easily massacre them with your musketeers. For besieging castles held by elves, destroy their gates with your long ranged weaponry and lure their troops out of the castle. Elven infantries are♥♥♥♥♥♥and they won't stand a chance against your melee troops or officers. Once most of the continent is under your control and only 1 or 2 factions remaining (excluding Crimes) that pose absolutely no threat to you whatsoever, concede a few territories to them and start farming kills. Only Crimes and a few severely weakened factions now stand in your way. Make sure to train your heroes/officers as much as possible by farming kills from weakened factions. Though you can actually conquer crimes with your armies alone, it doesn't hurt to have strong heroes as well. Once you begin your invasion of Crimes, you'll see what I mean. As soon as you invade and conquer one of Crimes' territories, you'll realize that Demokrisha's (Crimes faction leader) Lvl jumped to something like Lvl 70. Don't be alarmed. This is scripted. Also you'll also see that Demokrisha's lackeys also jumped from Lvl 8 to something like Lvl 60 or 50. Fortunately, most of these guys aren't that much of a threat to your battle hardened armies. But you should be careful when engaging heroes such as Demokrisha, Tuchulcha, Mextli and Ringtail. Demokrisha and Tuchulcha can cast powerful AOE spells so they should be taken out by long ranged units such as musketeers or ice mages preferably. Mextli and Ringtail are fast and tough so don't let them get close to your musketeers. Also make sure you use your summons to waste Ringtail's AOE ability. Officers that can use holy type magic such as Ishak, Cellina, Margarethe, Philline, Lucie, Gereon are very effective against demons so keep that in mind. Recruit as many clerics possible to support your frontline troops from behind. Otherwise defeating Crimes is pretty much the same as defeating other human kingdoms. Hammer and Anvil all the way. That's it for the Musket guide. Good luck on your first Musket campaign. I hope my guide was somewhat helpful to new players trying to learn how to play. I'll update the guide if devs release any new updates or DLCs. If you have any questions, don't be afraid to post it in the comment section. I'll answer them ASAP whenever I have time.